Nigeria’s technical director Shaibu Amodu insists that the Super Eagles’ main target should be qualifying for the 2014 World Cup, rather than trying to win next month’s Confederations Cup. But Amodu, who was in charge of the Super Eagles when they finished fourth in their maiden Confedera-tions Cup appearance in Saudi Arabia in 1995, told BBC Sport: “What’s the point in winning a World Cup dress rehearsal and missing out on the big party next year?The African Champions will face Tahiti, Uruguay and Spain in Brazil in the June tournament which doubles as preparation for the South American country for the hosting of next year’s World Cup. “The World Cup is a crucial one for the country. For us, it is the most important tournament. The Super Eagles are level on points with Malawi at the top of their World Cup qualifying group and face away trips to Kenya and Namibia next month. 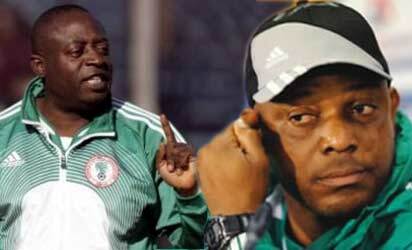 Amodu wants to ensure the team is focused on those matches. “There are tricky games ahead in the World Cup qualifiers and one slip can easily change the complexion of the group,” he said. Amodu’s comments seem to conflict with the view of coach Stephen Keshi, who told BBC Sport after the Nations Cup success in South Africa that playing at the Confederations Cup was his main target. “While preparing the team, I had my eyes set on Brazil,” he explained. Amodu wants Keshi and his players, who are thrilled by the prospect of competing against some of the world’s best teams, to put the tournament into perspective. “Yes, it is good to test yourselves against some of the best teams in a competitive level but it is not a competition to prepare the Super Eagles for better assessment,” he said.